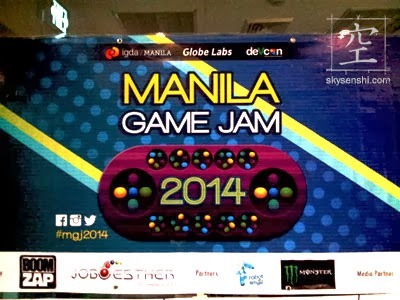 For this year’s Global Game Jam, the Philippines had 4 venues. These were: De La Salle – College of Saint Benilde (CSB) and Globe Labs for Manila, Nueva Ecija and Davao. Saturday and Sunday, I ran from Globe Labs to CSB then back to Globe Labs because my students, co-faculty and colleagues were separated in two venues. Whew! It’s probably one of the most profound themes I have ever seen used in a game jam. It would probably take me a day to process it. Like the previous GGJ events, you cannot post about the theme until Hawaii has started because it’s going to be the same theme used worldwide. Anyhoo, let’s take a look at what happened in Benilde. There were about 280+ people who registered and around 220+ appeared on Friday (January 24). I could see the stress in the department chair, Norman Lee’s face but he handled it pretty well. I had been working with Norman for a year now but it was only during this event that I’ve seen his management in action (since he’s usually coordinating with us online). He was walking around and supervising teams while delegating tasks and sending his troops out with swift efficiency. Most of the kids I saw were familiar faces. Many of the outsiders (industry participants and students from other schools) were probably taking a bath.It was a 48-hour game development challenge anyway. In fact some of the judges asked me if I took a bath before giving my cheek a beso. LOL. 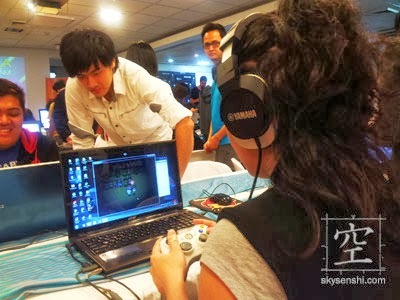 Above: Me trying out Sheryl Lim’s game with Kevin Hallare watching. Kevin says he does not remember doing this. Haha. That must be because they were all sleep deprived. Below: Posing with some of my thesis advisees and some of my perpetual sit-ins. I was about to exit the premises to visit the other venue when the guard asked me if we were returning. Guard: Babalik pa po ba kayo? Students: DOC BEA!!! DOC BEA!!! Me: *turns around* Ay, teka po. Skandaloso po mga studyante ko, balikan ko lang. After interviewing each of them and reminding them to join next year’s Global Game Jam again, I ran off to Globe Labs, where my other students and colleagues were competing. At the back of the hall, I was able to see my previous studio’s (Anino Games) newly launched game, Manila Rush. I will be reviewing this game sometime this week so I’ll talk about that in its own blog entry. Globe Labs originally had about 70 online sign-ups, which already gave IGDA Manila chair Francis Seriña quite a number to deal with. But there were many walk-in participants so he ended up wtih about 100+. I still wonder how he fit all of them in the venue. Aaaand I went around and played games… This one is Pandora’s Box, which was done by some students from APC, UP and CIIT. This game is True Sight, done by my colleagues from Anino Games: Felix Palabrica, Aileen Martin, Dino Diaz, Kane Aoki, Mop Siojo and Gats Africa. It’s so cuuuute and I liked how the sound helped me navigate the levels. MAAAAAAN, the games were GOOOOD! I can’t even pick which one I like best. More of my Anino colleagues: Tristan Angeles and Daniel Vallesteros. They won the Technical Excellence award. It was so funny how Tristan and I were discussing about going back to communication theories because of how deeply dependent on semiotics you’ll have to be. He said that they used Selective Perception on their game, which also bagged the “Di na tayo bati” award. And the runaway winners were Miracle Games (who also won the Best Capstone Project in their graduating batch): Zam Badua, Danni Taylan, AJ San Juan, Gem Raagas and John Pineda. This group had always been a creative, resourceful and a dynamic bunch so it was hardly surprising that they’d win three awards: Best Art, Best Design, and Jury’s Choice. Norman Lee must be very proud to have two winners from CSB in two venues. The winner for Benilde Game Jam was Ishie Socro’s group. All in all, a fun event. I want to join the next one, but I feel like I should be helping Norman next year. You can play all the games submitted to the Global Game Jam 2014 here.